Easter is just right around the corner and that means lots of chocolate for me! It also means C is getting his first Easter basket. Now being only 8 months old chocolate isn’t something on the top of our list to load his Easter basket with. 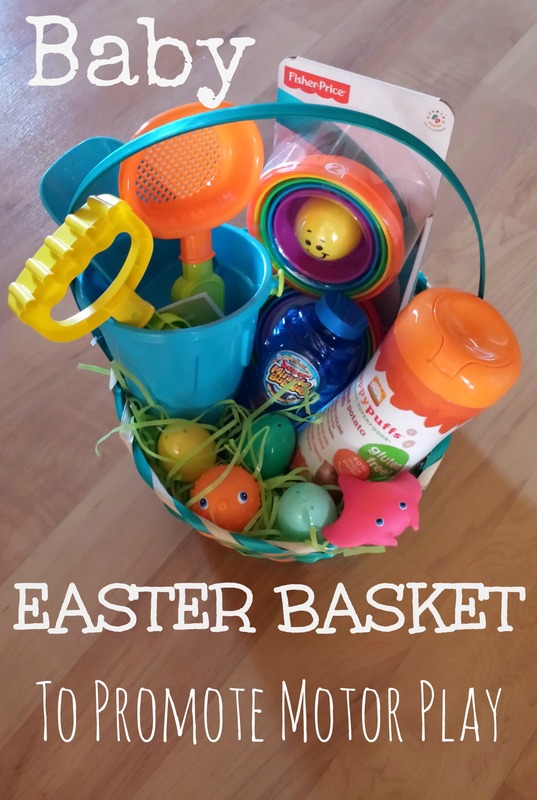 This Easter basket is going to consist of a lot of things that he needs but also things that promote baby motor development. 1. Organic Puffs– C has started some self feeding. He is quite an independent guy and once he figured out how to get food to his mouth on his own he hasn’t been to keen on anyone placing a spoon in his mouth! He loves these puffs! I love the fact that I feel he is at the point where he is safe using them and they also offer him the opportunity to be working on his pincer grasp (when his thumb and pointer finger pick up an object). It’s eating and motor practice all at the same time. 2. Bubbles– No, C can’t blow bubbles yet, but they sure are fun for him to play with when we blow them. On top of that they promote gross motor skills. There just may be a bubble post coming up with ideas on how playing with bubbles can promote gross motor play with babies. 3. Stacking Cups– These are great for play with baby. By the time babies are ~12 months old they understand the stacking concept. Stacking helps with eye hand coordination as well as fine motor skills. Likely gross motor will get thrown in too with building and knocking down towers with your baby! 4. Bath Toys– C is a busy boy and we have started introducing bath toys into his bath time. Bath toys are fabulous for fine motor skills. He can grasp, squeeze, and transfer toys from hand to hand. Therapy while bathing! 5. Plastic Eggs– I have to give the basket an Easter look! Unfortunately for C his eggs aren’t going to be filled with candy (this year anyway) but there are still uses for them. We plan to fill them with rice and hot glue them together. Another great way to work on fine motor skills and jam out to music at the same time. Music is great for babies. Check out my post on why! 6. Sand/Water Toys– These are great to promote fine motor skills as well as incorporate sensory play. I made C a sensory table that was so simple, be sure to check it out. I hope he can utilize it this summer as well as play outside! Oball -I have loved these since C was just a few months old. Mama OT also has a great post on how to use the oball with your baby. Shape Sorter – Even if your baby isn’t sorting shapes quite yet. The game of putting in and taking out will come very soon. My store at Pink Oatmeal promotes getting the kids moving at home, in the classroom, and in therapy! If you prefer Teachers Pay Teachers you can find me there too with even more ideas! Previous Post: « The Bumbo Seat – Good, Bad, or Both?